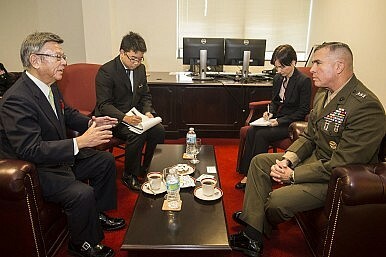 Governor Takeshi Onaga meets Lt. Gen. John Wissler, Okinawa area coordinator, U.S. Forces Japan, in December 2014. On August 4, Japan’s central government made the surprising announcement that it will temporarily halt construction on a controversial new U.S. air base in the Henoko district in Nago, Okinawa. The new base is supposed to replace the current U.S. Marines Corps Futenma Air Station, but local political opposition has kept the project stalled for nearly 20 years. Tokyo’s announcement came after concerted efforts by Okinawa’s government to block the project. Okinawans believe the burden of hosting U.S. troops should be more evenly distributed across Japan, and want the Futenma base relocated out of Okinawa entirely. Many have been growing increasingly angry over Tokyo’s refusal to take local sentiment into account. Okinawa’s governor, Takeshi Onaga, was elected in November 2014 after basing his platform on strong opposition to the Henoko base. Since taking office, Onaga has sought to suspend the work through legal action, while popular protests have indicated public discontent with the base construction. Onaga even visited the United States, hoping to win support or at least sympathy for the Okinawan point of view. Until this week, however, Japan’s central government, had shown little inclination of changing its plans. When Japanese Prime Minister Shinzo Abe visited the United States in April, he argued that the relocation of the air base to Henoko should be completed “as soon as possible.” But, as Yuki Tatsumi outlined in a Diplomat article in June, in practice Abe’s options for overruling Onaga’s opposition are less than ideal. “The local government holds a great deal of authority in issuing various permits required for the construction of the replacement facility to proceed,” Tatsumi wrote. With Abe’s public approval ratings sliding as he tries to win passage for equally controversial security legislation, he seems to have decided to fight one political battle at a time. Chief Cabinet Secretary Yoshihide Suga announced on Tuesday that construction on the replacement base will halt from August 10 to September 9. During that month, the central government will hold “intensive talks” with local officials in Okinawa. In turn, Onaga promised that he won’t revoke the local government permit that allows construction to continue – at least not before September 9. [T]here is nothing to indicate that the Abe administration will deviate during this period from its set policy, which is that the relocation to Henoko is the only solution…We cannot help [but] suspect that the administration sees the period until Sept. 9 as nothing more than “temporary truce” until the national security bills become law. A more generous reading, supplied by the Japan Times, would be that the Abe administration hopes to use the truce and an economic carrot – the two sides are also in the middle of discussions on how much money the central government will allocate for development in Okinawa next year – to reach an understanding with Onaga. Still, the discussions promise to be difficult. Onaga wants to talk not only about the specifics of the Henoko base, but about the historical rationale for hosting bases in Okinawa in the first place. “We have never held substantial discussions [with the state] about history and deterrence power,” Onaga said. “We would like to discuss issues including geopolitical ones.” Such issues cut to the heart of the U.S.-Japan alliance, and cannot be resolved in a month.